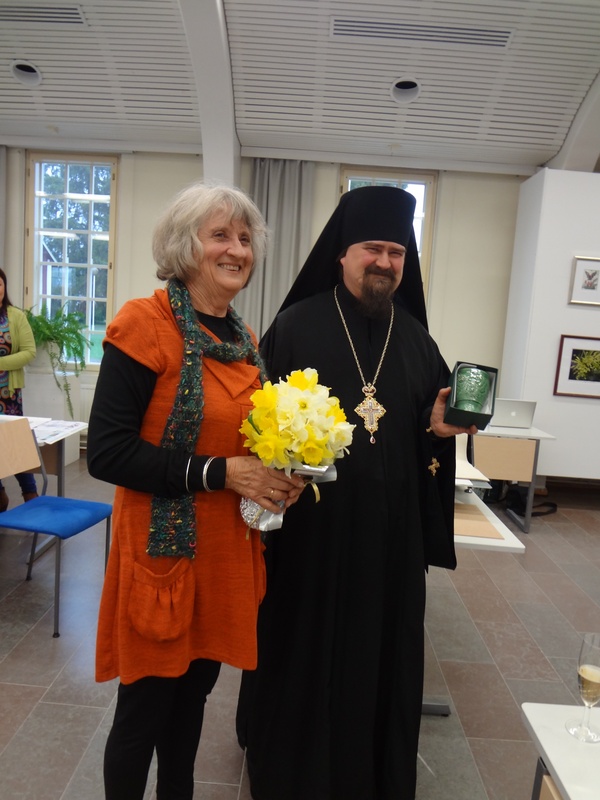 Last Tuesday evening the exhibition, Flora, by Australian Printmaker Helen Clarke, was opened by Igumen Archimandrite Sergei from New Valamo Monastery. Father Sergei was very gracious and happily posed for photo opportunities with me. I have never had an exhibition opened by such distinguished company. He was very happy to receive my gift of a handmade ceramic goblet made by Garry Zeck from the Swan Valley. The show has been selling well; as these brightly coloured images of Australian Flora have not been seen before in Finland, I had no idea how they would be received. Happily, people enjoy them enough to buy them. My lovely students from the printmaking workshop have been making purchases too. The workshop is now completed, having produced some terrific works by the dedicated and talented students. Some regularly worked until midnight. I don’t know how they managed to surface the next morning, but they did, with more layers of ink on their prints! 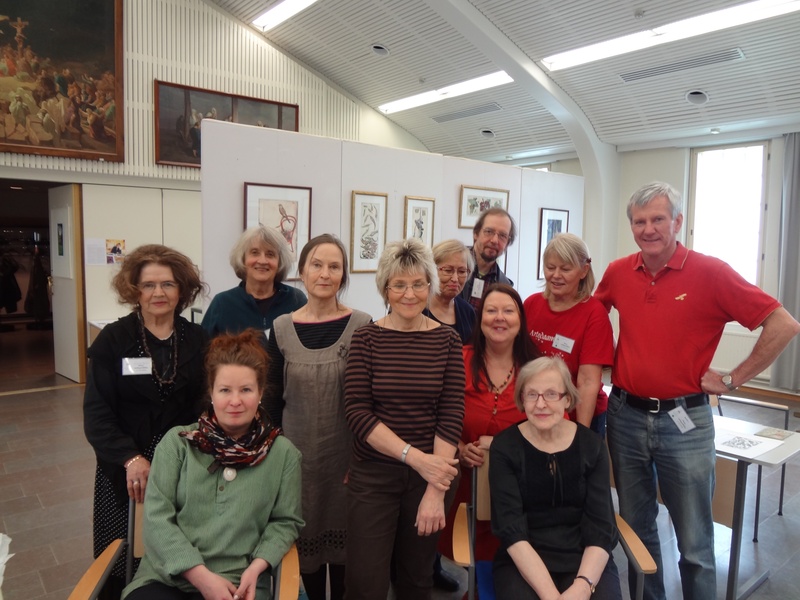 Thank you to all those who have helped and encouraged me to take my work to Finland. We are now planning our visits to places of interest around Finland. The exhibition has been framed, arranged and hung. Jaana’s incredible organising over the last 18 months has been wonderful! The staff from Valamo (Rami, Marti, Karl and Aila) have been so helpful, organising everything for the workshop at the same time. We are really spoilt as we usually have to do everything ourselves. The workshop stars tomorrow afternoon with an introduction and tour around the grounds. Very civilised! I will add that we can eat in the lovely dining/cafe free throughout the workshop, this includes all meals. There will be pics of food!! The exhibition opening is on Tuesday afternoon but tonight we may watch the Eurovision spectacle on TV. Maybe. Anyway we have some Valamo champagne for celebrating an unlikely win by Finland. We will drink the champers anyway! Pic of Helen documenting the exhibition. There is a religious component, of course, with many religious paintings hanging in the exhibition space too. Finally left the hectic pace of Helsinki to travel 370 km to our rural retreat, Varistaipale. En route we visited the old town of Porvoo, making a quick dash into a lovely local gallery. We have had warm sunshine, rain, light snow and a cold,cold breeze in one day. Sounds like a normal northern summer! We will be visiting Valamo to organise final details for the workshop and exhibition. In between we managed a walk along the canal in front of the house. The canal has 3 locks which enable local boats to be raised or lowered 14.5 m to travel to the next lake. But we have seen no activity yet as it is early in the season. Thank you to all the lovely folk who have responded to the blog – it is great to hear from you! 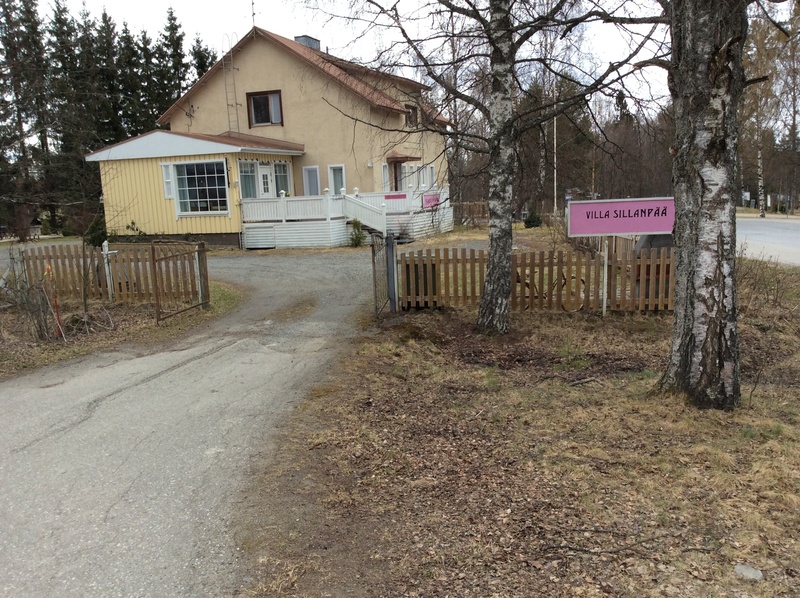 The pic is Villa Sillanpaa, our lovely artist accommodation. We have the full top floor which is really well furnished and have access to a studio space if needed. We are indeed spoiled! After a day and a half in Helsinki, we are exhausted, exhilarated and energised all at once. The 10 hours stopover in Singapore was tiring. It seems that once you have seen one airport, you have probably seen them all! Finnair was a lovely airline, even down to the marimekko designer paper serviettes. We managed a few hours sleep so that we could enjoy the day ahead – and we did! We now have accommodation in a flat about 5km by tram from the city centre. Helsinki is a city of blocks of flats, none of which is more than 7 storeys high. View of our flats. So much work goes into having an exhibition overseas. The costs become a bit scary too! 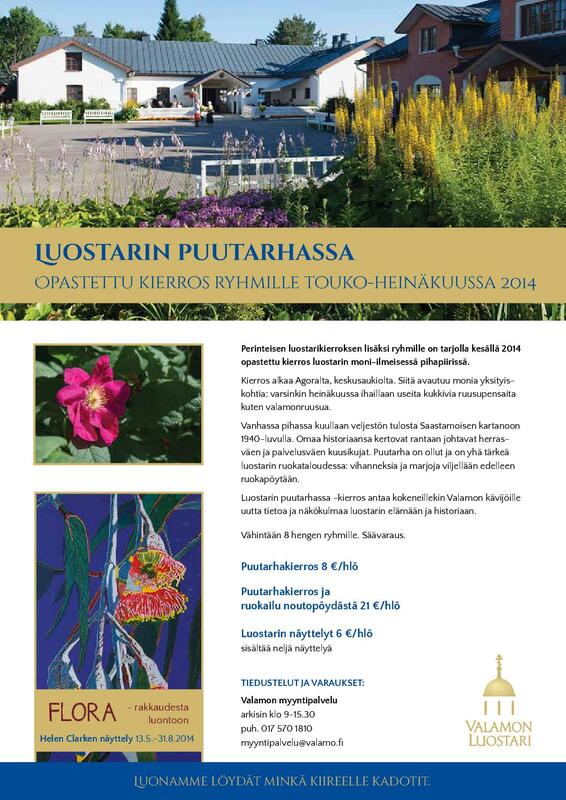 But the busy folk at New Valaam Monastery have created brochures for the exhibition and workshop. I hope you can read and understand Finnish! They have chosen my image ‘Caesia 1’ for the flyer. Click on the image to see it a little better. Jaana from Finland has just visited. 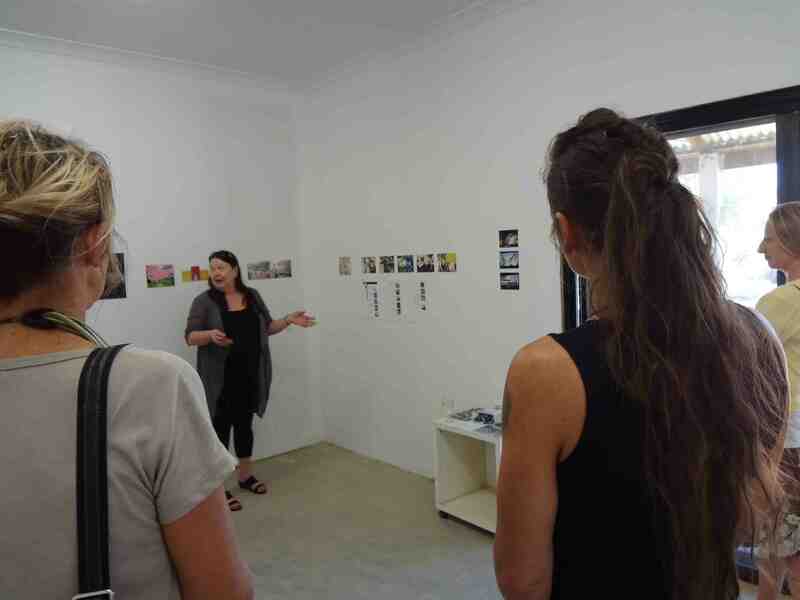 She brought with her a pop-up suitcase exhibition which we exhibited at Studio 38, Bruce Bradfield’s new studio in Greenough. Jaana is discussing the artworks with a very appreciative audience. The tickets have been purchased and the works for my exhibition have been chosen. We are on our way to Finland in April! Planning is really underway for the sojourn in Finland. Also work in the studio is gaining momentum. I have almost completed my next lino print – pics very shortly. 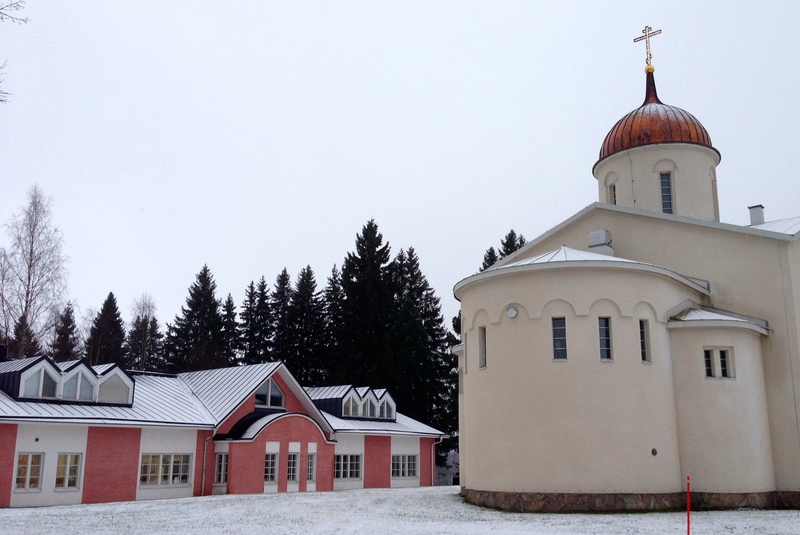 In the meantime, this pic shows the Valamo Monastery where the exhibition and workshop will be held. The white and red ochre building is where all workshops are held. There is a lovely cover of snow, quite different from the intense heat we have been experiencing in Australia this summer. Our Finnish friend, Jaana, is visiting us next week. I think she is escaping the northern winter for a while.